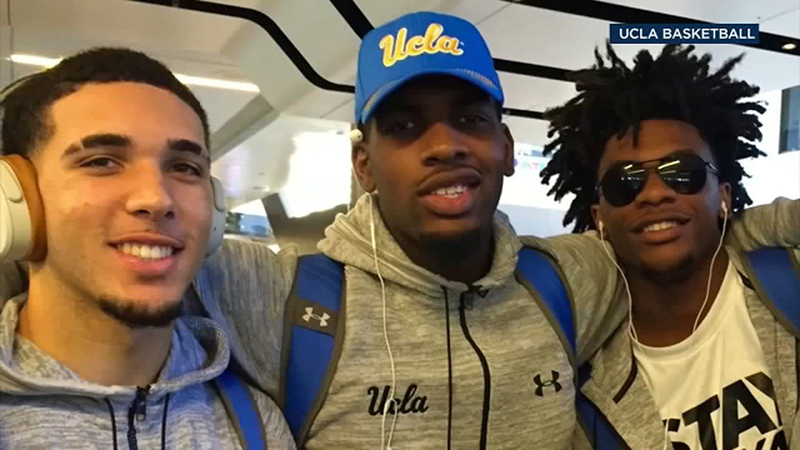 LOS ANGELES -- Three UCLA basketball players detained in China on suspicion of shoplifting are on a plane back to Los Angeles. Freshmen LiAngelo Ball, Jalen Hill and Cody Riley were detained in Hangzhou for questioning following allegations of shoplifting last week before the 23rd-ranked Bruins beat Georgia Tech in their season-opening game in Shanghai as part of the annual Pac-12 China game. Ball is the brother of LA Lakers guard Lonzo Ball. The rest of the UCLA team returned to Los Angeles last Saturday without the three. There was no immediate word from UCLA on the players' status for the team's home opener Wednesday night against Central Arkansas. The school said the three players, along with coach Steve Alford and athletic director Dan Guerrero, will make their first public comments about the matter on Wednesday morning in Los Angeles, but won't take questions. A person with knowledge of the Pac-12's decision said any discipline involving the players would be up to UCLA. The person spoke on condition of anonymity because the conference doesn't plan any sanctions. Scott thanked President Donald Trump, the White House and the State Department for their efforts in resolving what he called "the incident with authorities in Hangzhou, China." He indicated that UCLA made "significant efforts" on behalf of its three players. Trump said Tuesday he had a long conversation about the three players' status with Chinese counterpart Xi Jinping. Ball, Hill and Riley were expected to have an immediate impact as part of UCLA's highly touted recruiting class. All three are Los Angeles-area players. Ball, a guard, averaged 33.8 points as a high school senior and follows in his brother's footsteps after Lonzo played one season in Westwood and left early for the NBA draft. The Bruins traveled to China as part of the Pac-12's global initiative that seeks to popularize the league's athletic programs and universities overseas. The China Game is in its third year, and while the scandal was developing the league announced that California and Yale will play in next year's edition.